Finger picking a 12-string is hard to do. The 12-string loses a lot of jangle when you use a classical free stroke (Tirando instead of Apoyando). I tried modifying the saddle so the fingers attack both strings in the course more equally. DADGADJohn also tried it a while with some success. He says it's all how you attack the strings - thumb to get the high octaves, fingers to get the lower strings. I'm trying rest strokes now and the sound is much, much better - akin to using a pick, and both strings are quite audible. I've also found out that a good rest stroke sound depends quite a bit on how the strings leave the bridge pins. The octave strings don't seem to matter as much - the fatter string is away from the hand so the angle of the pair is already good. The tops of the unison courses (they are the ones to the left of the forefinger in this picture) tilt away from the hand. So striking them together is a little like riding a bike around an off-camber turn. You can alleviate this off-camber effect in the two unison courses by getting the pairs closer to each other. No surgery is required. 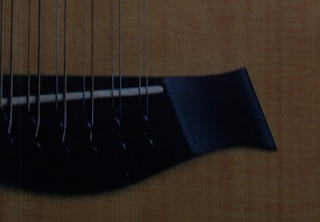 Face the front of the guitar with the neck up vertically. You need to channel the longer string of each course under the pin that is above it. You can see this in these final two pictures. It doesn't seem to make the bordering pin pop out. I actually went as far as filing a flat spot on the side of the front set of bridge pins on my old Taylor 555 and my new GA4-12. I don't want them TOO close together because, as you mention, there are times when I want to emphasize the upper or lower octave. How about doing the Rickenbacker trick ie putting the octave strings UNDERNEATH - that way the normal classical stroke should hit both. Thank you anonymous for mentioning the Rickenbacker trick. Your comment prompted me to try it, with great results.